Patriots, our liberty is being threatened by DISRESPECTFUL DEMS. Stephen Miller was CALMLY eating his breakfast of seeds and cracked corn out of a PUBLIC bird feeder this morning when RUDE liberals with NO MANNERS approached him and drove him away with a broom. Make no mistake, patriots: This is a slippery slope. We are descending into a shameless society with NO SENSE OF DECORUM where people are being IMPOLITE to government officials quietly lapping up sugar water at a bird feeder just because they have DIFFERENT OPINIONS about whether or not MIGRANT children should be TREATED WITH DIGNITY. CRUDE DEMS think that just because they DISAGREE with Stephen Miller’s STRONG policies about PUTTING IMMIGRANTS IN PRISONS that they can barge into his PRIVATE BIRD FEEDER LIFE and stop him from nibbling on NUTRITIOUS millet. 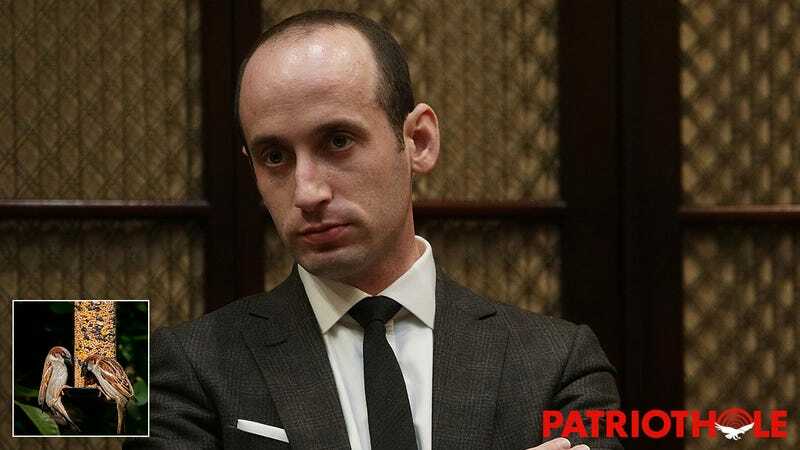 This is yet another example of LOW LIFE liberals lacking any semblance of DECENCY or CIVILITY, and we can guarantee that the HYPOCRITE LYING MEDIA won’t be covering the DEPRAVED DISCRIMINATION that Stephen Miller experienced while attempting to CHOW DOWN on LOVELY GRAIN at a bird feeder. It has never been clearer: We need to PROTECT OUR FREEDOMS AND BIRD FEEDERS from the DISGUSTING LEFT!